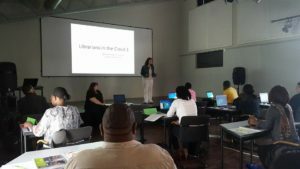 It was a huge privilege to teach 20 librarians from the Johannesburg Public Library, on becoming digital citizens. A digital citizen is somebody who can use programmes such as Windows, Paint, Word, PowerPoint and Excel with ease. This person is also comfortable with working in the online environment, and staying up to date on new trends – both as downloaders and uploaders of information, and do so taking the necessary responsibility for it. We know that all users from these libraries will benefit in many ways, and so would their fellow colleagues with which they will be sharing their newly acquired skills. It was a great experience, and as one of the participants said: “You brought us from the ground and lifted us on top of the clouds!” Well done to all participants! Thank you to the Goethe Institut Johannesburg for financial support to do the training during September 2015. Module 1 (2 days): Getting to know computers and other e-devices * Technology trends * Windows * Typing * Editing & designing graphics using Paint * Word processing using Word * Professional presentations using PowerPoint * Webinars. Module 2 (2 days): Spread sheets using Excel * Information literacy skills using the Internet and online tools * Doing research * Ethics & responsibilities in an online environment * Creating a web page & blog using WordPress * Social media for marketing purposes * Creating online forms * Emails using Gmail * Open Access * Creative Commons Licensing * Copyright & IP * Plagiarism * Referencing * MOOCs * OERs. Module 3 (1 day): Presentation: Plan an event at your library, and demonstrate how you will be integrating the various programmes and skills acquired. Design a graphic in Paint, create an online form using Google Forms, email your CV and a cover letter in Word, compile a budget in Excel, and create a web page for the event using WordPress. Present using PowerPoint.